You may want to think twice about adding fries to that double cheeseburger order next time you're out at the local fast-food joint. 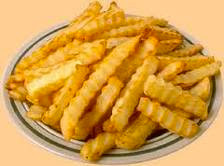 In Indiantown, Florida last week a 32 year-old guy went to town on his 51 year-old wife for, and I quote, "eating all the french fries". Can't you see the next McDonald's campaign? They'll go from "I'm lovin' it" to "Fries worth fightin' for". Anyway, the guy started swinging a 12 inch bat at his wife - now there's a weapon, maybe he used to play little league. He could have been a short fella - you know, a small fry. Now, puns aside, this called to mind a classic radio newscast that made the rounds when I was starting out in radio. If audiotapes could go "viral" this was it. In one of the first instances of a Canadian radio station adopting an American format, in the late 60s/early 70s a Windsor radio station tried to attract Detroit listeners from across the border by, among other things, jazzing up their newscasts, which were read by deep-voiced announcers with machine gun deliveries and utilized that infamous journalism credo if it bleeds it leads. The station was CKLW "The Big 8" and the image-laden stories were featured on their "20/20 News" newscasts 20 minutes after the hour and 20 minutes before the next hour. One story in particular had a theme similar to the story out of Florida where the announcer said, words to the effect "...that ticked the hubby off...and he picked up his Louisville Slugger...and proceeded to bat a thousand...against the little lady's head." Getting back to our current case, the action all took place in the couple's trailer (I should have guessed.) And hubby was somewhat intoxicated at the time (but, of course). He must have been. He only managed to hit the woman's foot. But that was enough for cops to charge the guy with false imprisonment with a weapon, battery and assault. So next time you go out for burgers with your loved-one, think carefully before you answer the question "do you want fries with that?" Although, I do prefer my fries NOT battered. Well maybe I do. Isn't that what a Tater Tot is? A battered up french fry? I thought you were going with the story of the guy who's getting money because McD's made him fat. What's next? I'll be getting millions from the Coca Cola Corp because DDP makes me burp too much? Hmm. That's a tot, erm, I mean thought. Quirks: I've come across some pretty strange stories in my time but this one takes the cake...er, ah, fry. Just say no to the fries. It's safer that way. Or, makes sure you are not around a bat. yes they have been telling us that a diet high fat and salt and calories and are bad carbs according to health blogs. Just add your story to the dangers. Bluezy: There you go. One more reason to avoid them. Or be prepared to duck if you eat them. Sadly, I can totally believe that story. Was that ketchup on those fries? Yum. Great, now I want fries.. I'll just have to make sure to buy enough of them so M won't come home from his karate and karate chop my foot when I didn't save him any. Ziva:Do you like cheese fries? I think I read somewhere recently that you really like cheese. Here in Canada we have poutine - curds and gravy on fries. You might like it. But I don't think M wouldn't chop your foot. No whey. Poutine sounds absolutely disgusting. I would chop my own foot if it meant I would never have to taste poutine. Ziva: Oh, but you haven't lived until you've eaten poutine, And sometimes you don't live after having eaten it. This world is just full of previously unknown dangers! First cow burps, now french fries. Thank you for making our lives a little safer, Dufus! Nicky: Hey, life is complicated. Glad I can help you sort it out! All I have to say is that there are some crazy effin' people in the world, NoName. I mean totally nuts. Mike: Yes there are. But without them I'd have nothing to write about. So, here's to the totally nutty people. That's why I live by myself... much safer that way. 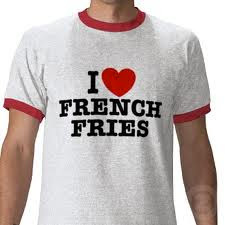 But, if I found someone who'd offer me all their french fries, I'd take it under consideration... hold the trailer. Boom Boom: Crinkle or curly fries?